A Bride On A Budget received these rings for review. All thoughts and opinions belong to ABOAB. Buying a wedding band for a man is so much pressure. It comes well after the fact that he has purchased the absolute most perfect engagement ring for you. And that puts a whole heck of a lot of pressure on you. He figured out how to get you exactly what you wanted, what you dreamed about for the longest time ... and you have to follow his performance by getting him something equally perfect. But I'll admit it. A man is a lot harder to shop for. More often than not, a woman will describe her perfect engagement ring, tell her man exactly what size and shape of diamond she prefers, and what metal she likes. And then a man will say something like, "Oh I don't care" or "I don't even like jewelry" or the worst: "I'm sure I'll like whatever you think is nice." 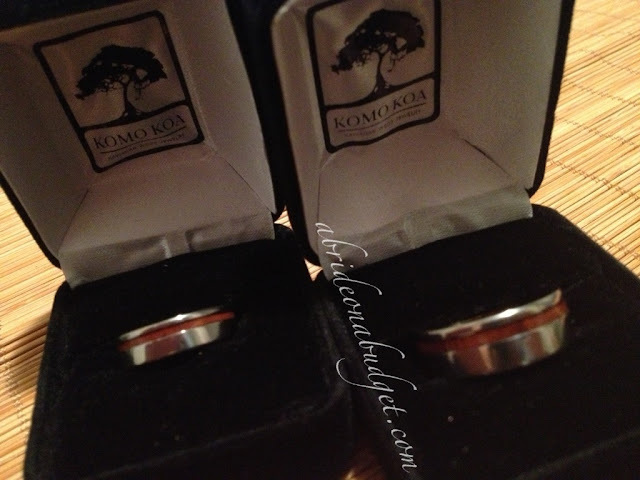 Thank goodness for Komo Koa, a seller of koa wood rings. The brand sure made it a lot easier for me to buy Pete's wedding band. In fact, I actually got us both matching bands because, yes, these are unisex. The larger your finger, the wider the band will be, so if you have small fingers and your man has bigger ones, you will have a daintier ring and his will be more manly, so no worries there. One of Pete's favorite trips ever in life was to Hawaii. He's been all over the US, traveled Europe for three months, but Hawaii is always the trip he talks about. Koa is only found in Hawaii, so I knew this had a special meaning to him. The ring isn't just wood; rather it is wood sandwiched between titanium. Titanium is pretty indestructible (according to that David Guetta song), which is perfect for Pete. The wood inlay actually has a lifetime guarantee, so no matter what your man does to it, Komo Koa will replace it. Actually, if you check out their website, you can read about someone who actually dropped a ring in the garbage disposal -- and sure enough, the brand repaired it. 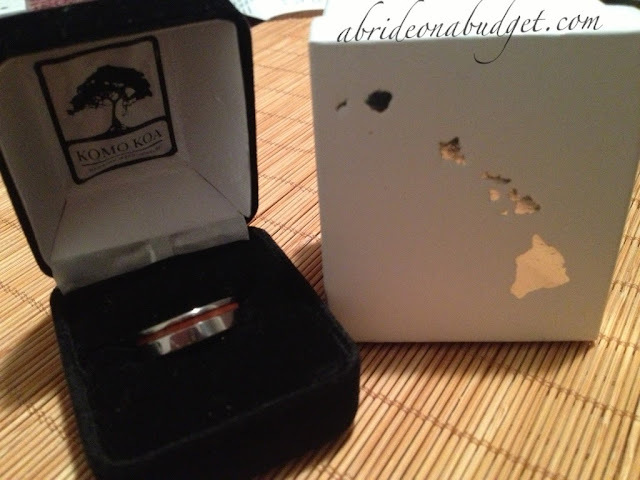 The rings come packaged in white boxes that bear Hawaii on them. Inside that box is the ring box, which has a photo of a koa tree on the inside. If you're giving this to your fiancé without him seeing it prior, this packaging will absolutely give him the story behind his ring without even having to tell him. The rings start at $219, which is a fantastic price. You can definitely spring for the extra $40 to get them engraved (although, if you don't, all rings come standard with a photo of Hawaii engraved inside). 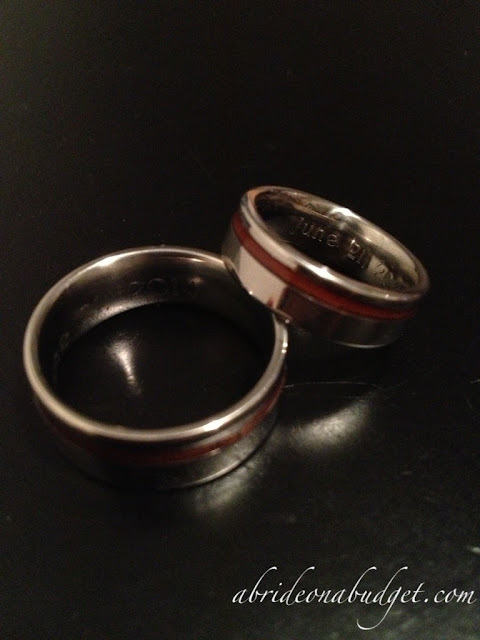 We had ours engraved with our wedding date (you can see it in the photo above). Originally, Pete thought that we should have it engraved with our names, but I thought our wedding date would be much more sensible ... just in case he ever forgets it; he can just check his ring for a reminder. From an aesthetics standpoint, the koa wood rings are gorgeous. The site has a bunch to choose from, and we picked the Offset Koa Wood Inlay ring (the wood inlay being slightly off center is beautiful). As soon as Pete opened the box, he asked when he could start to wear his ring. "As soon as we say I do," I said. "Really?" he asked. "I want to wear it now." To hear that from a man, you know these rings are the right choice. The rings are really comfortable too. They slide off and on with ease and don't weigh my finger down. I was a bit worried they would arrive and feel heavy, but that wasn't the case at all. They're a good size and are very lightweight. They seem really durable and can take a punch, but the sheet that comes with the ring suggests you avoid sustained constant with heat or moisture. So take it off when you swim, shower, or decide to tour the sun. The wood inlay appears to me (and correct me if I'm wrong) to have a type of sealant over it. It's not exposed wood, although it is suggested that you periodically apply a wood finishing wax or paste. I would definitely pick that up from somewhere like Amazon; don't try to clean your ring with lemon Pledge. 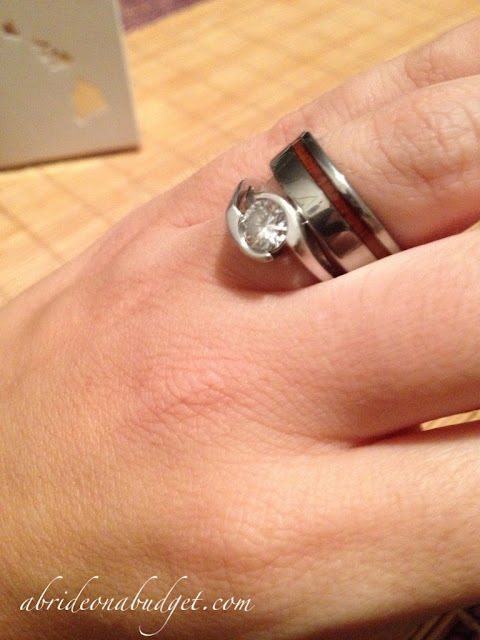 BRIDAL BABBLE: Do you think your man would love these rings? I think that is a great idea to engrave the wedding date on it so you remember. I love it. My fiance and I got matching wedding bands. My engagement ring matched as well. So many people in my family have that wedding anniversary!! I love the rings I hate how ours are so mainstream and not unique! That wedding band does not go well with the engagement ring at all. WOW! Koa rings actually create the magic of oneness. Just love such rings! How long did it take for the rings to arrive? I am getting married in 4 months and want to make sure I order it with more than enough time! I love the look of these rings!! Our rings are engraved and my husband still doesn't remember our anniversary! These would be perfect to have if you got engaged in Hawaii or married there to!